We now live in an age where radical technology can help the blind to see, an impressive enough accomplishment in its own right that gets even more mind-bending when you consider what's it means for the future. UV vision? Eyeballs that zoom in and out like a camera lens? It's coming! Scientists 'round the world are working to improve the retinal prosthesis system, or what many people simply call a bionic eye. The leading device in the States is called the Argus II, created by California company Second Sight. It costs about $145,000 and has been used by some 80 visually impaired people in the last few years. It works by combining an external eyeglass-mounted camera and a sophisticated retinal implant. The camera uses a small microchip to process what it sees, and then wirelessly sends that data to the retinal implant, which has 60 electrodes in it that provide information to the optic nerve—which is what discerns light, movement, and shapes. But the vision people get with the bionic eye isn't like typical sight. They see contrast and edges of objects, but only in black and white. The ability to naturally see light and color has been eliminated by damage to various cells in the eyes, but with enough use, the brain learns how to make sense of these images that appear from the electrode's signals. Argus II users have reported successfully reading large-print books, crossing the street on their own, navigating an unfamiliar home, or seeing images of their spouse for the first time in decades. Unfortunately, the Argus II is not able to lift them people out of technical blindness, which in America is 20/200. The best that users have reported is about 20/1000. But upgrades are coming. And here's where things get really interesting. The next iteration of the Argus II will include the ability to perceive colors, using algorithms that measure electrode stimulations, according to Second Sight. The device will provide sharper images, and be able to focus eyesight like we do a computer screen, increasing resolution and brightness. Over in Germany, a leading bionic eye product called the Alpha IMS is a self-contained bionic eye—which means instead of an (awkward) external camera, it has a built-in sensor sending signals to the retina. The other major advantage is it uses 25 times the electrodes of the Argus II, which greatly increases resolution. Bionic eye researchers at University of New South Wales in Australia predict there will be a fully functioning artificial eye available by 2020. The next great leap forward will be to bypass the eye and go straight to the brain. At this point, many visually impaired people aren't able to benefit from the implant, which requires a functioning retina to work. That leaves people with damaged retinas or that have lost their vision to infection, or diseases like glaucoma or diabetes, out of luck. Second Sight is "working on a new implant that bypasses even the retinal layer, and implants electrodes directly onto the visual region of the brain," Second Sight CEO Dr. Robert Greenberg told the BBC. A trial for this is currently scheduled for five blind patients with Age-Related Macular Degeneration. This could herald the breakthrough millions of blind people have been waiting for. It inevitably conjures up scenes from science fiction. Take the ocular enhancements of Star Trek's Geordie La Forge, who has infrared sight, night vision, and telescopic vision. The developments in retinal implant technology now raises the question: Are these these seemingly sci-fi upgrades possible for everyone in the future? It's a question that's yet to be answered, but there's reason to be optimistic. Some scientists working on bionic devices know the device is not only capable of helping the visually impaired, but, like all bionic devices, giving human beings superhuman ability. "For me personally, one of the inspirations was Steve Austin, the bionic man," Greenberg recently told Bloomberg TV when asked if his technology could be applied to other industries like gaming. "I think direct interface is probably in the future. I don't know how far out, but it's probably there." What he means is if researchers can send signals directly to the brain, the brain can learn to interpret those signals and essentially recreate them as a visual image or function. Take telescopic sight, for example, which is already here. We can teach our brains to interpret the powerful zoom-in or zoom-out functions of cameras—we could learn to see much farther and closer than the natural human eye. In fact, Brian Mech, VP of Business Development of Second Sight, told me, "We could tomorrow allow our patients to see outside the visible spectrum by using a different input device than a visible spectrum camera (an IR camera for example). We can also already provide telescopic vision." But it gets more bizarre than that. 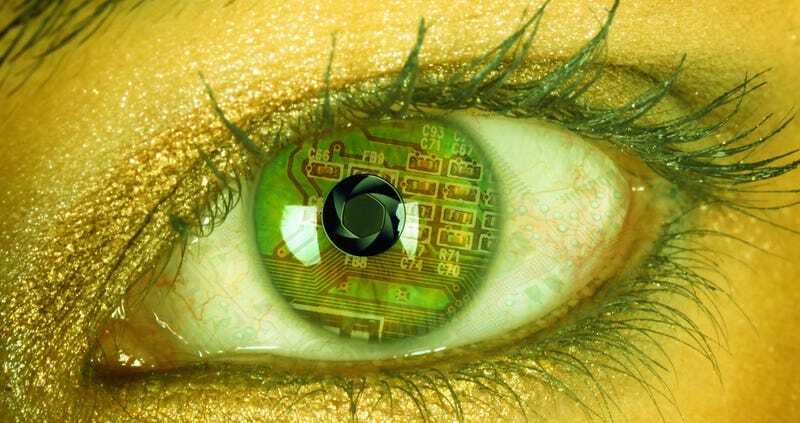 If bionic eyes can see the entire electromagnetic spectrum, that would include infrared vision, heat-sensing capabilities, ability to detect certain gases, and probably even the ability to see right through objects. We could end up with those powers of perception too. We already have devices to measure all these things—the key is shrinking them enough to get them into an implant (or other tethered bodily device) that communicates directly with the brain in a way that renders the input sensible. It's still speculative, for sure. But far into the future we might become a walking science lab, able to utilize a wide range of devices and applications built into our bionic eyes. The applications would be endless. Soldiers could possess X-ray vision that detects landmines in the ground they're fighting on. Parents could detect dangerous gases in their children's rooms in the same way a carbon monoxide alarm functions. People on first dates might use airport scanner technology to scope each other out, even see what's beneath each others' clothing. If we can project images directly into the visual areas of our brains, we may see things we never imagined, including the millions of microbes living on each of us. But it gets even more bizarre than that. A robotic eye may able to be set so it never sleeps and will always be on guard, ready to wake you in danger or when it gets light outside. It will also be Wi-Fi enabled, and ready to record your entire life and stream it live on YouTube—or ready to instantly post images on Facebook and Twitter. Or ready to play video games inside your head, like Greenberg alluded to. Your favorite sitcom could play right through the eye into your brain, completely skipping TV. Currently, the human eye sees about 1 percent of the light spectrum in the universe. That's not much when you think about it. Futurists like myself think that decades from now the bionic eye will improve so much that it will likely see far more than that tiny 1 percent. And because we have two eyes, it seems plausible some people—especially biohacker and cyborg enthusiasts—will replace a biological eye with a bionic eye once that technology arrives. Experience of our universe will never be quite the same.